Fiction – hardcover; Atlantic Books; 288 pages; 2010. Translated from the Spanish by Edith Grossman. Red April by Santiago Roncagliolo isn’t your usual crime novel. Perhaps it might be better to describe it as socio-political thriller. Whatever the case, it’s definitely hard boiled, as I guess you’d expect given it’s set in one of the most violent places on Earth: the city of Ayacucho in Peru, where the communist party (Shining Path) began its bloody reign of terror in 1980. According to Wikipedia, Ayacucho is also famous for its 33 churches, one for every year of Jesus’ life. Holy Week, the religious festival held in the week before Easter, is a significant event on the calendar, and it is in this particular week of March 2000 that Red April is set. But the carnival-like atmosphere and the procession takes a back seat to the gruesome discovery of a burnt and mutilated body in a hayloft. Associate District Prosecutor Félix Chacaltana Saldívar is put onto the case. But he’s out of his depth and seems strangely at odds with the military and legal rulers to whom he must report. When more bodies turn up, suggesting a serial killer may be on the loose, Saldívar buries himself in paperwork (his preposterously written reports are included in the text) and unwittingly becomes mired in a corrupt investigation that looks likely to end in Saldívar’s own death. His only saving grace appears to be the love of two women: his long-dead mother, to whom he’s built a shrine in the bedroom in which she used to sleep; and Edith, a local waitress, with whom he develops a fledgling romance. But, for the most part, Saldívar’s story is an unrelentingly bleak, violent and oppressive one, only matched by the terror and barbarity of the guerilla war being waged around him. At times the book is incredibly shocking and disturbing, no more so than when Saldívar is sent to Yawarmayo, a rural outpost, to supervise the presidential elections. After a hellish seven-hour bus ride and a two-hour walk, he arrives to find slaughtered dogs hanging from the streetlights. The entire scene is described in all its gruesome, stomach-churning detail. It’s hard to fault the brooding atmosphere of this novel, which builds and builds as more mutilated corpses are discovered. But the story felt strangely distant to me, as if I couldn’t quite engage with the characters, because I was too busy trying to make sense of the cruel and corrupt society in which it was set. Everything felt incredibly alien — and terrifying. Red April is definitely not for the faint-hearted. It’s a very male book (there is little reference to females beyond their “use” as sexual objects and all the characters are macho and difficult to like) and is full of bloody violence and power struggles. There is not one ounce of hope in the narrative. I suspect those who like intelligent hard boiled crime novels will find a lot to like here, but if you’ve a weak stomach you might like to give this a miss. 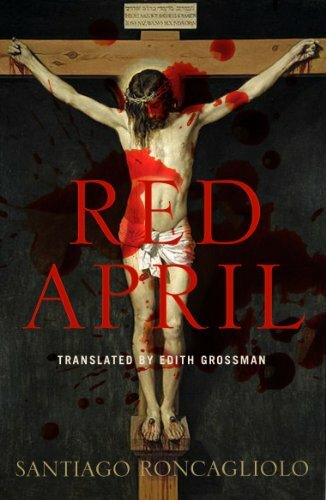 Red April won the Alfaguara Prize, a prestigious literary award for an unpublished Spanish-language novel, in 2006. I was impressed by the way the corruption in the country was combined with a fast paced thriller. I’ll be ensuring I read any of his future books. As a keen reader of translated crime fiction, I must give this one a go, when I am feeling in a strong mood! Thanks for the review, I’ve not heard of this book before (knowingly). I thought I had a strong stomach too, Jackie. Generally my reading tastes are quite male, having grown up reading my dad’s library… but this one was uncomfortable reading. Perhaps if I’d gone to book group and chatted about it, I might have revised my rating upwards, but I didn’t really enjoy this novel. I appreciated it, but didn’t find it much fun. Grossman seems to have a (well deserved) very good reputation as a translator, so I can understand why her name on a book would prompt you to read it, Steph. It’s an uncomfortable kind of read, Maxine. If you like I can pop this in the post to you; I was only going to donate it to Oxfam, so you’d be most welcome to it. Thanks, Kim, that would be really nice of you – and I’ll repay the compliment by offering you any of my “recently read” pile (via email). But – no rush – your previous post indicated the size of your mountain to read, and all I can say is, mine is worse! I enjoyed this one to a degree but I didnt love it. I thought it was trying to hard to please too many markets rather than be the best book it could be… is that harsh? I just thought it tried to tick thriller, politics and religion and in doing all failed in all slightly. I have gone off it the more I have had distance from it which is most unlike me. Really good review Kim, you captured how I felt about this book and it’s plot so succinctly. I didn’t love it either but perhaps for slightly different reasons. Thanks for the link too!